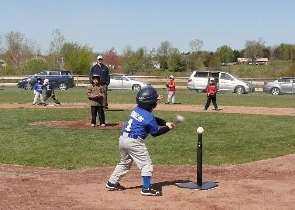 The T-Ball division is open for any child who will be 4 or 5 years old on, or before, May 1st. The division will consist of 4 and 5 year-olds. Games are played on real, T-Ball sized fields at the Halfmoon Town Park, complete with an infield and basepaths! Players will start the season on a tee, and advance to 'coach pitch' as the season progresses. The only equipment needed is a glove. Team shirts and hats are provided. Although many kids purchase their own helmets and bats, each team will have a set of helmets and bats to use at games and practices. Many kids will also purchase baseball cleats, but they are not required. If you are interested in coaching or have any questions, please e-mail us anytime.